Grease and line with parchment an 8" springform pan. Add the butter and sugar into the mixer bowl...mix until light. Add vanilla and one egg at a time, beating between the additions until light and fluffy. In thirds, alternate adding the flour and sour cream. Begin with flour, end with sour cream. Spread half the batter in the pan. Line half the apple slices atop the batter. Sprinkle the apples with half the streusel. Top with the remaining batter. 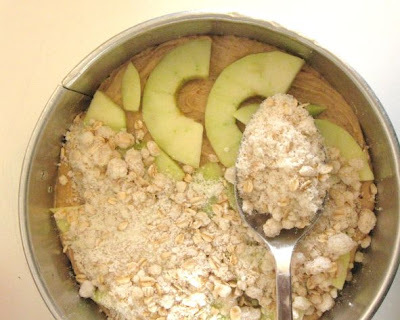 Add the apple slices. 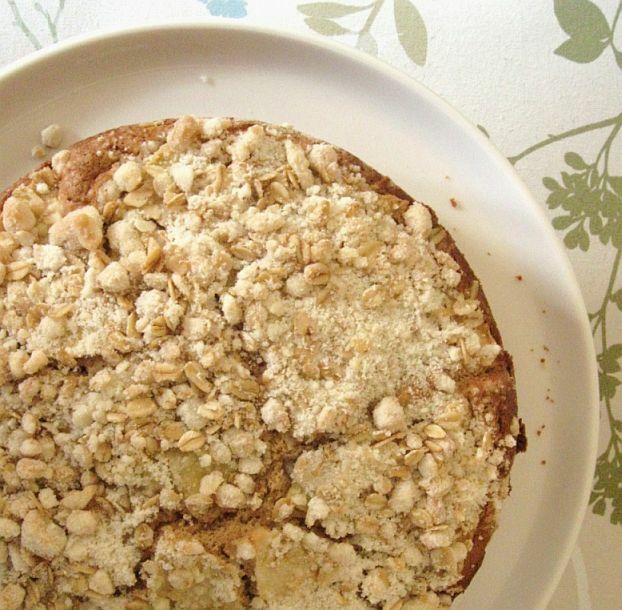 Top with remaining streusel. Bake for 60+ minutes. Use a toothpick in an area without apple, near the middle. It should spring back when lightly touched. This is not very sweet, as I tend to bake for us, it's my perference. If you are...say...from the South...you might care for more sugar, the recipe can take to add up to 1-1/8 c. sugar. This would also be good with some added almonds or pecans. Lil' dude asked for seconds ~ be still my beating heart....today I said yes.